Relaxation, refreshment and harmony placed in the heart of nature. Your vacation in a different way. 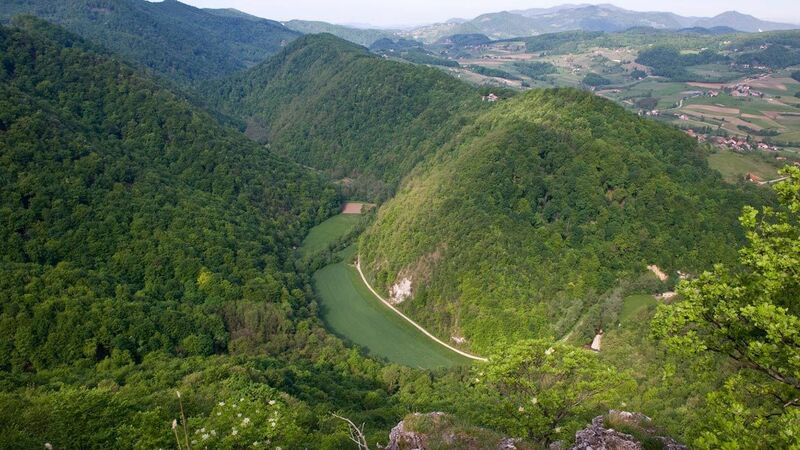 Podčetrtek and the surroundings of Terme Olimia offer many natural and cultural sites. You are welcome to check some of our hints for exploring (we also arrange tours for previously announced groups). The first stop will be made at the household Mraz, which holds a little zoo, and where you can see different types of birds and ostriches. The road train continues its journey to the land of stories under the hills of Olimje. In the Witch hut you step into the world of Slovene fairytales and become acquainted with Kekec, Bedanec … The final stop is made at the deer farm Jelenov greben, where you can also see and feed the deer. A Franciscan friar will guide you through a baroque Parish church and the 3rd oldest pharmacy in Europe. A rich variety of home-made herbal medicines is also available there. You can then step into the chocolate boutique Syncervs, the world of chocolaty sweetness, where delicious chocolate is made, in addition to the attractive chocolate products. 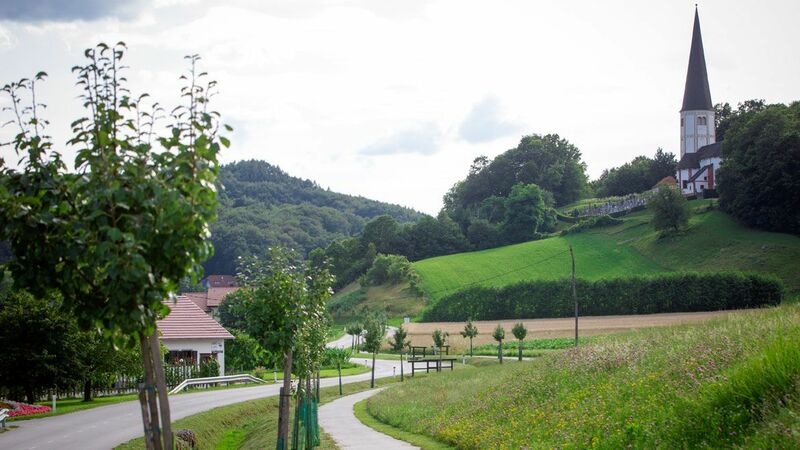 The trip will then continue to Jelenov greben (a deer farm and a restaurant) and a restaurant Amon. Our last stop will be made at a brewery and tavern Haler, where you will see and learn more about the production of beer. 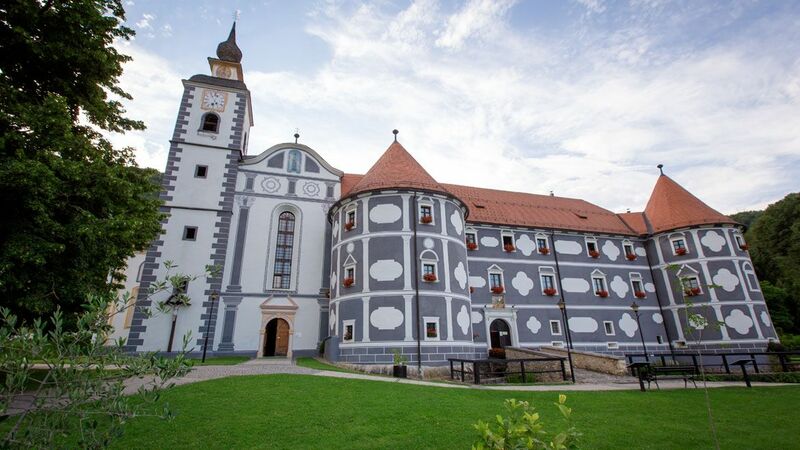 An interesting panoramic road train tour will take you to Rogaška Slatina, where you will follow the production of glass, and have a look at Kristalna dvorana (Crystal Hall) and "a healing park". Hotel offers 135 twin-bed rooms. They are equipped with bathroom (shower or bathtub), toilet, television, radio, telephone, mini bar, safe, bathrobe, a bag with bath towels, air conditioning, internet connection, internet on TV and a balcony. There are also 24 rooms available that are connected between each other (two each) with a connecting door. A bottle of thermal water will await you in every room. There are 4 apartments at the hotel. Each of them has a bedroom and a living room and a separate bathroom and toilet. 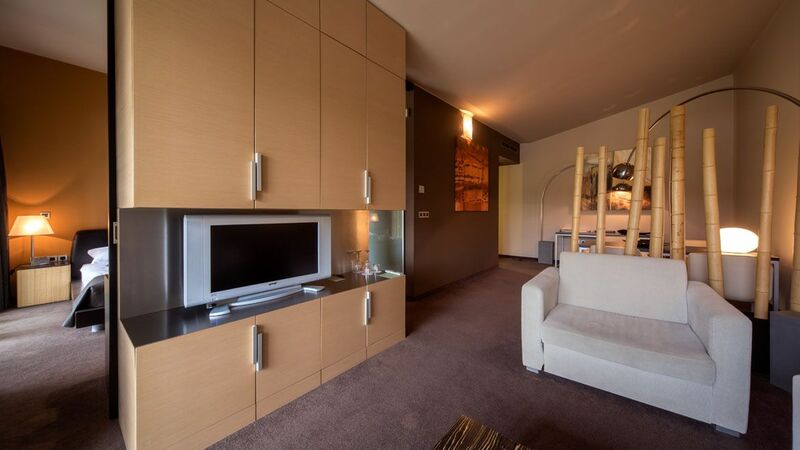 Apartments are equipped with two televisions, radio, mini bar, safe, bathrobe, a bag with bath towels, air conditioning, internet connection, internet on TV and a balcony. A bottle of thermal water will await you in every room. There are 6 suites at the hotel in which the bedroom and the living room are separated with a door, and there is also a separate bathroom and toilet. Suites are equipped with two televisions, radio, telephone, mini bar, safe, bathrobe, a bag with bath towels, air conditioning, internet connection, internet on TV and a balcony. A bottle of thermal water will await you in every room. In Spa Armonia we spoil all your senses – with a carefully designed range of services, top quality ingredients, proven skills. You will experience exceptional care, regardless of whether you choose: face beautifying, a massage from a distant land, Khanya ritual, body shaping with coffee and soya, depilation with sugar paste, a personalised programme, such as one for pregnant women or romance for two in the candlelight. As the icing on the cake, enjoy a superior facial, pedicure, or manicure. This is not just a foot massage, but also a special one-hour ritual that awakens your legs and body. Everyone that is otherwise familiar with foot massages get ready for something exceptional. Classic or exotic, with stones, herbs, Tibetan bowls, or chocolate? Choose and enjoy, relaxation guaranteed! The modern pace of life, polluted air, stress, and other environmental influences can all be noticed on our skin. It is important it stays healthy and elastic, so give it special care. Skilled therapists, excellent products – and you, committed to healthy skin and vital body. Beautiful and neat nails are a reflection of our health. Treat yourself to a manicure and pedicure at least once or twice a month. Do not forget about two of you! Surprise yourself and your partner with a relaxing couple’s evening, with romantic candlelight or soapy dreams. We are not responsible for the consequences! Are you exhausted, robbed of energy and vigour because of stress? Wellness package includes instantaneous relaxation, a rejuvenation and detoxification ritual, and pays particular attention to the man. The thermal water of Terme Olimia is a recognised natural healing remedy, while the greater virtue of our water is its drinkability. 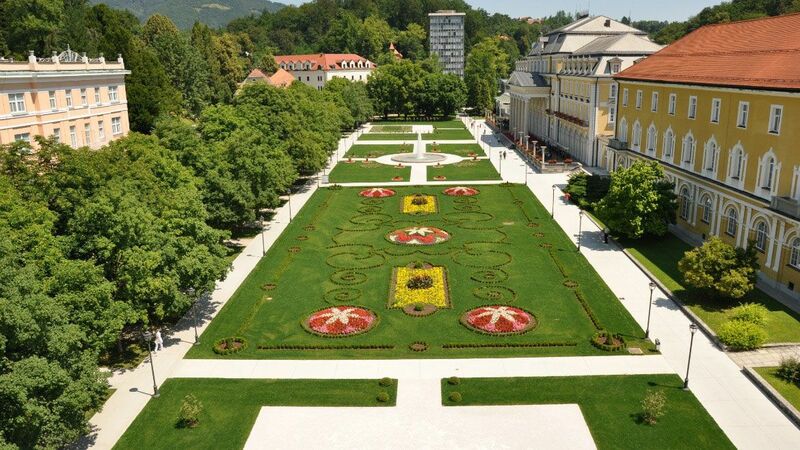 Drinking from the thermal water spring has many positive effects on health and vitality. In Terme Olimia there is very special thermal water, springing from the depths. When we give ourselves to this water in the pools, it hugs us from without, when we drink it, it caresses us from within. But no matter how, it always strengthens our health and well-being. 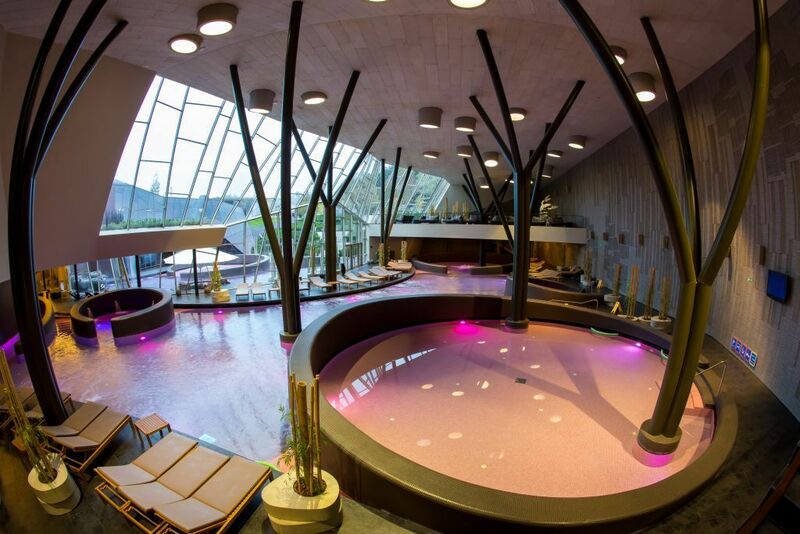 The healing properties of thermal water in Terme Olimia have been proved over the decades by its use for therapeutic purposes in spa treatments. Recent studies have shown that this thermal water is suitable also for drinking. The natural healing remedy of Terme Olimia is a slightly radioactive thermal water with a temperature of 30-37 °C, which contains magnesium, calcium, and hydrogen-carbonates. It is pumped from wells (springs) to a depth of 520 m in the area of kamp Natura and Termalni park Aqualuna. At the source its temperature range from 24° to 44 °C. The temperature of the pools (Orhidelia, Termalija, Hotel Breza, Aqualuna) is obtained by mixing water from individual wells. Thermal water of Terme Olimia positively influences the reduction of negative impacts on health and the effects of stress that accompany modern lifestyle. Bathing in thermal water relaxes muscles and increases blood flow of tissues, invigorating and strengthening the body’s defensive mechanisms. It reduces the negative effects on your health and the consequences of stress, relaxes tense muscles, and stimulates blood circulation; the silicon content has a significant effect on the health of connective tissues, bones, and cartilage, while low mineral content stimulates the cleansing of your body as well as invigorates and strengthens body’s defence mechanism. Terme Olimia encourages all guests to drink thermal water, as its specific low mineral content contributes to body cleansing. A bottle of fresh thermal water is brought to your room every day. 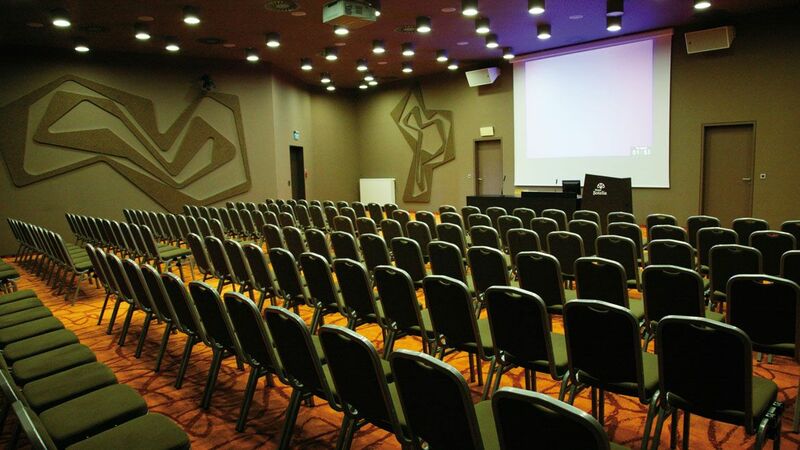 Terme Olimia is the perfect choice for one-day or longer congresses, conferences, seminars, and all other business and also social meetings. There are eight completely equipped halls available; the largest has a capacity of 350 seats. When organising meetings, we happily listen to your specific requests and guarantee adequate refreshment and accommodation to all participants. We particularly recommend organisation of longer events; in that way you will experience other services we offer. 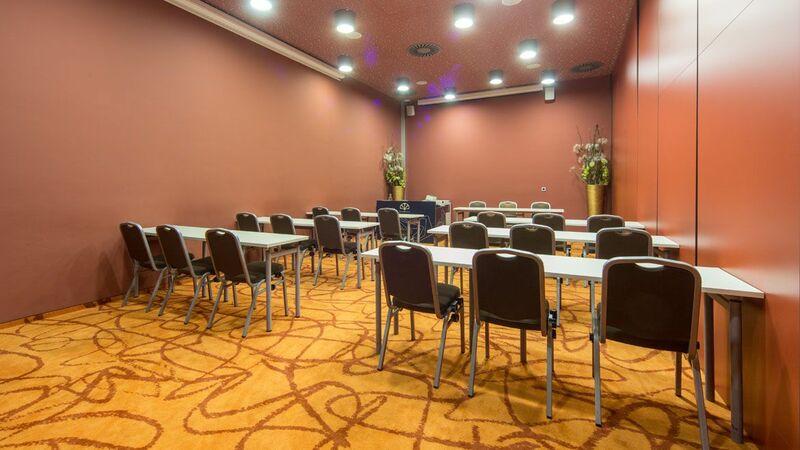 In the congress centre at Wellness hotel Sotelia, there are five halls available and you can access halls at Hotel Breza and Aparthotel Rosa via an underground hallway. One smaller conference room is also available at Guesthouse Lipa. Altogether, we can seat approximately 750 participants. For their well-being with us, together we can prepare diverse programmes with wellness or sauna services and tours of the surrounding beauties. 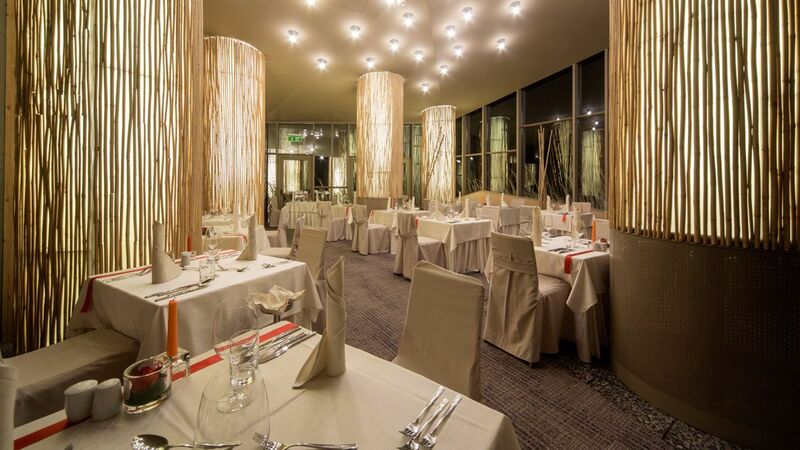 We will make sure your events at Terme Olimia will be a success and the participants pleased. 8 fully technically equipped halls and conference rooms at Kongresni center Olimia at Wellness hotel Sotelia are planned as multi-purpose areas, suitable for different types of meetings. In a harmonic environment, Konresni center Olimia awaits, away from the city bustle, suitable for conferences, consultations, meetings, seminars, exhibitions, and presentations, motivational programmes, receptions, and various social events, such as banquets, fashion shows, and feasts. All areas are equipped with the latest audio-video technology for a supreme performance of your event and uninterrupted work. 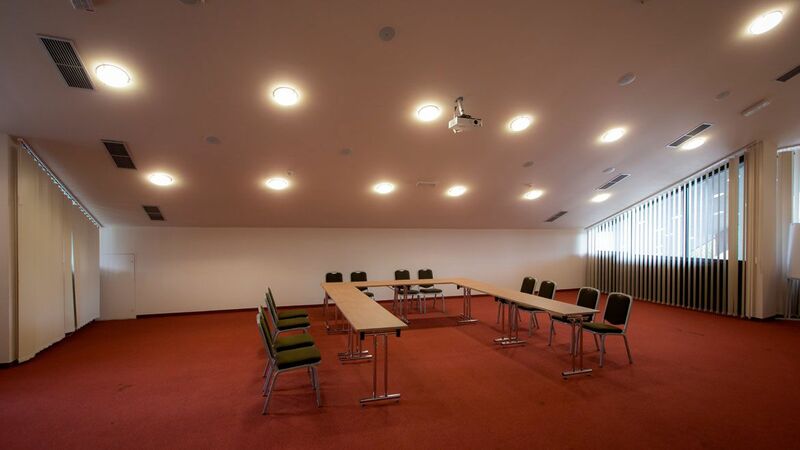 A modernly equipped conference hall at Konresni center Olimia at Wellness Hotel Sotelia****. This hall is suitable for a wide spectrum of meetings (seminars, conferences, teambuilding programmes, fashion shows). Has a capacity of 350 seats. Is a smaller hall, suitable for interactive work in smaller groups as an addition to work in a large hall as well as for meetings during multiple workshops. It is suitable for up to 50 persons, and connected to the hall Erica for up to 90 persons. Is connected to the halls at Wellness hotel Sotelia and Aparthotel Rosa via underground hallway. Suitable for up to 80 persons. Zelena dvorana is a part of Conference Centre Olimia. The hall, with daylight and a beautiful lobby, is suitable for exhibitions and receptions. Suitable for up to 160 persons. Conference room Veronica is a smaller hall, suitable for interactive work in smaller groups as an addition to work in a large hall as well as for meetings during multiple workshops. It has a capacity of 30 seats. 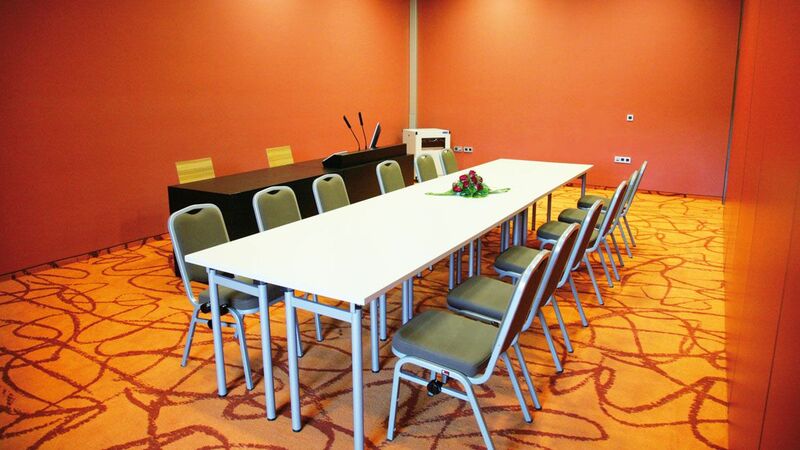 Conference room and Zelena dvorana offer a possibility of organising various forms of independent meetings or work in smaller groups. It has a capacity of 40 seats. In the inn, you can enjoy culinary delicacies at breakfast, lunch, and dinner. You will leave truly renewed after breakfast for strength, lunch for good mood, and dinner for a sound sleep. 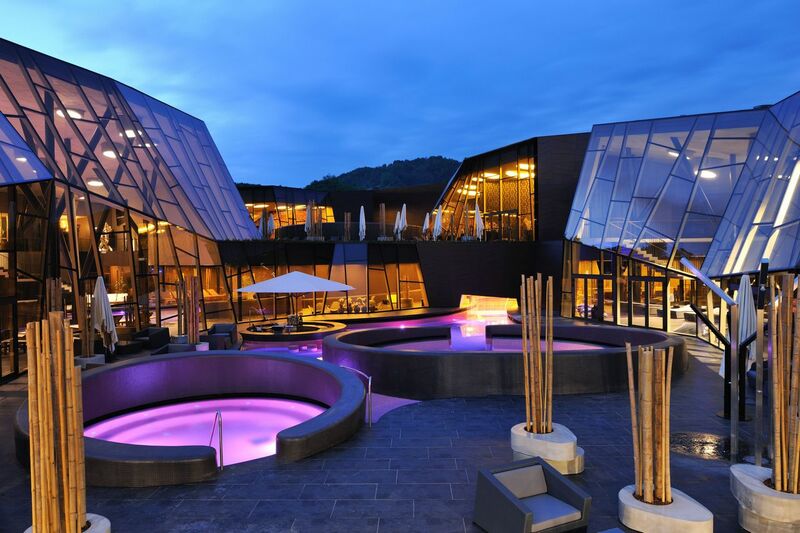 In the gorgeous ambience of the restaurant and with a wonderful view of the surrounding hills, you will enjoy the chefs’ topmost culinary delicacies. Again and again you will be surprised with different flavour combinations that will take you to supreme gourmet pleasures. 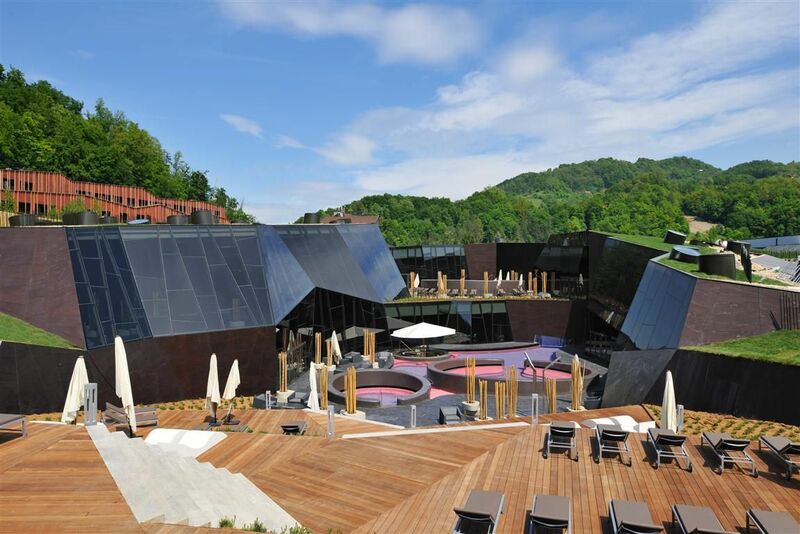 The speciality of Wellness hotel Sotelia is its close connectedness to nature. Its position, diverse structure, green roofs, and large light areas create the feeling of harmonious connectedness with the surrounding nature. We await you with special kinds of pampering that are offered by Wellness center Spa Armonia, with sophisticated catering and social areas. There is also a congress centre at the hotel. 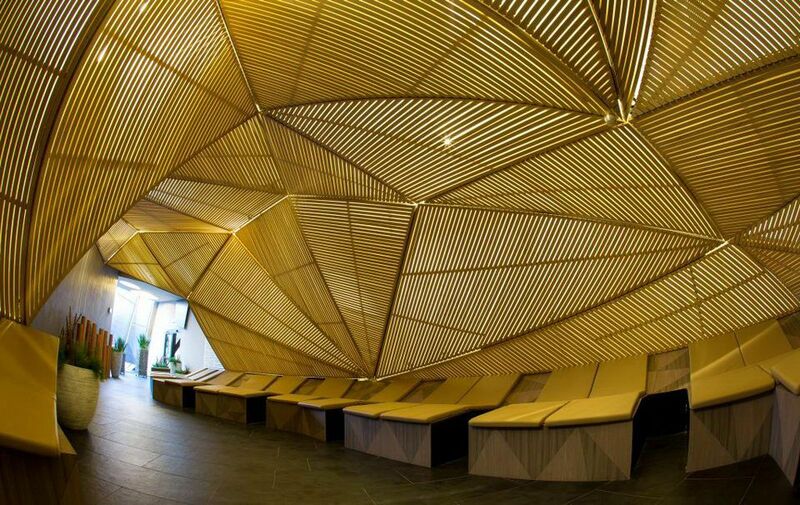 Wellness hotel Sotelia excels in individual architectural features – frisky facade, diverse structure, and expressive interior. It is connected to a nearby forest and gives the feeling that nature is embracing you. 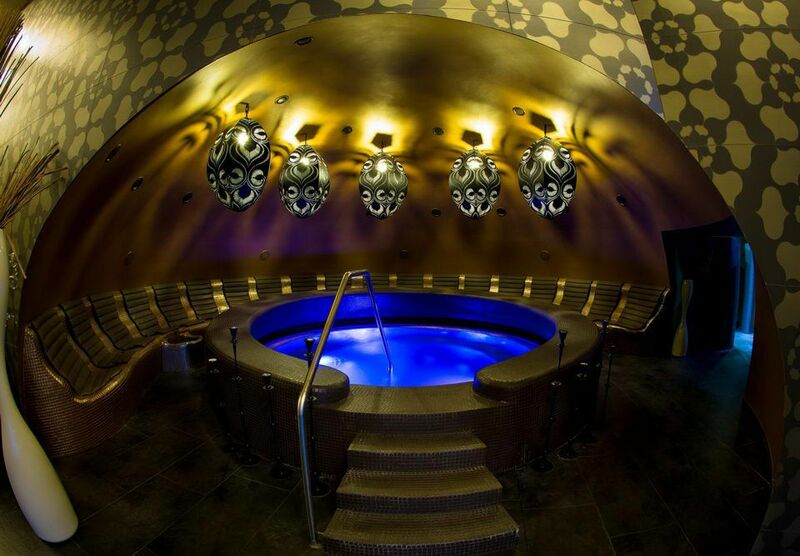 Lots of pampering awaits you at this 5-story hotel with 150 rooms. 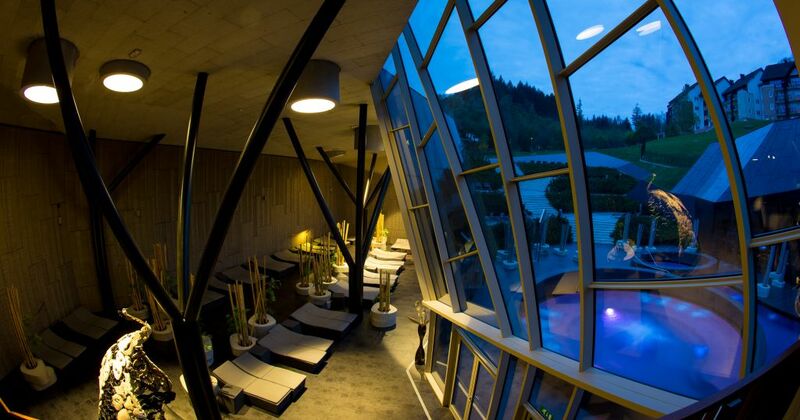 Your secret wishes will be fulfilled by Wellness center Spa Armonia, restaurants Basilicum and Gratiola, wine store Virstain and an underground hallway will take you to pools and saunas at Wellness center Orhidelia. High equipped fitness center and a specially prepared trainers allow each visitor, to beginners and experienced athletes, a quality work in a group or individually. Fitness is located in the wellness center Termalija. A football pitch and athletics stadium in Podčetrtek serve football players and athletes in their preparations. Soccer field: width 58 m, length 98 m. The athletes can use the athletic track with four lanes of tartan, length 376 meters, marked 400 meters, and with tags training ground for throwing spears, balls, disc and hammer. 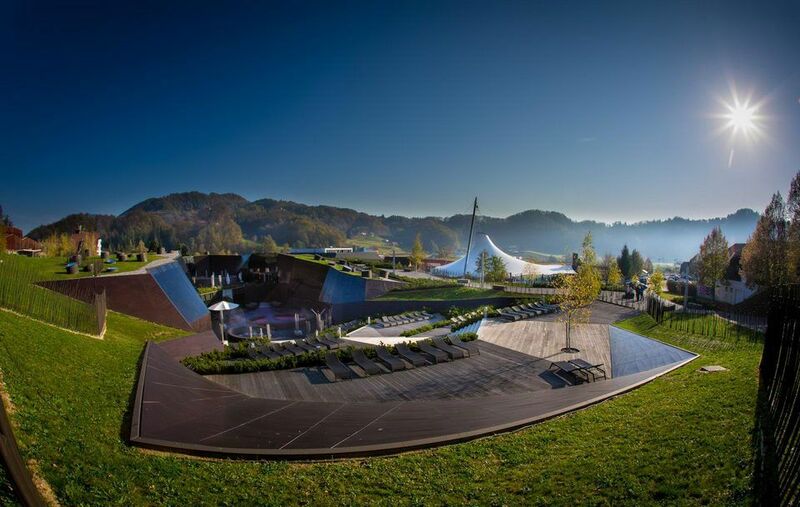 The new and modern multi-purpose Podčetrtek Hall was built in 2009 and can be used for fitness training in handball, indoor football, basketball, volleyball, martial arts, sport climbing, and other indoor sports. Guests can also use badminton, tennis, and squash fields and a climbing wall. A football field with an athletic track is located only 500 metres from the hotel; a route to it leads through the woods and represents a warm-up option prior to coming to the sports object. 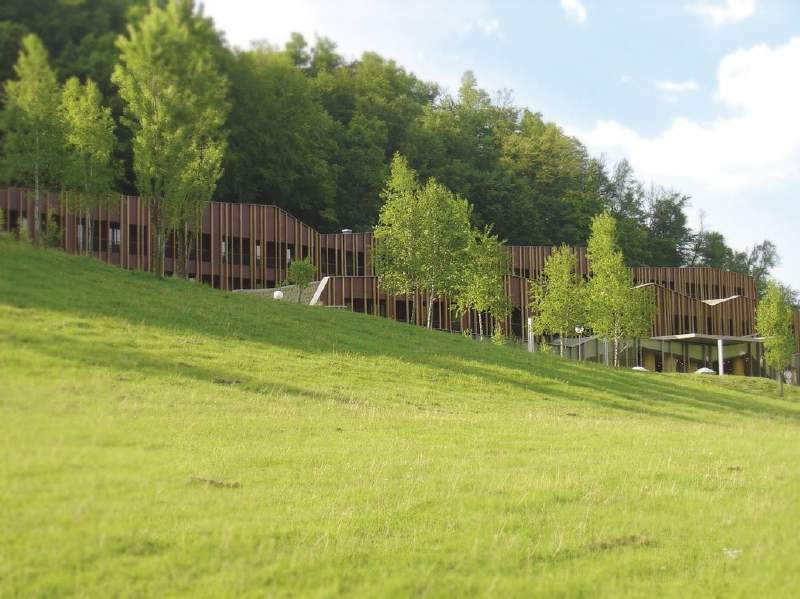 At Sports Park Gaj, in the vicinity of Terme Olimia, all that think of themselves as active recreation enthusiasts as well as those less active will be able to strengthen their bodies and souls. Families are also welcome. Sports Park Gaj offers 4 tennis fields, sand volleyball and street basketball courts. At Sports Park Gaj, you will enjoy intact nature and fresh air while strengthening your body. For all golf lovers there is a wonderful golf course in Olimje. Forests, vineyards, flowers, birds’ singing and the murmur of a brook will lead you to the magic and peacefulness the nature has to offer; golf course representing the symbol of this beauty. A walk among sand and water obstacles is a real challenge, and every hole needs a different approach. The golf course is 2 km away from Terme Olimia. For beginners or those who would like to improve their golf play, a school of golf is organised, in addition to an advanced course with various packages to choose from, as well as individual lessons. Which enable you to explore hidden spots of the surrounding areas of the Sotla river, or you can simply join us when we visit villages adjacent to the state border which is open for free crossing. You can go on a bike trip by yourself or accompanied by a sports animator. All bicycles, including those for children, can be rented at the Gaj Sports Park. This path is appropriate also for those who are not in an excellent shape. Many bikers and trekkers like this tour. It is appropriate for a bit more experienced cyclists. Pass the castle granary and the Veber meadow; continue towards Silavec – Zaborovec – Vodole. On your way back you pass a forester’s cottage Encijan, Olimje, and finally arrive at Podčrtrtek. Subscribe to Wellcard Club Terme Olimia and collect points on all purchases that will allow you to get gift vouchers, discounts, and other member benefits. What is the Wellcard loyalty card? 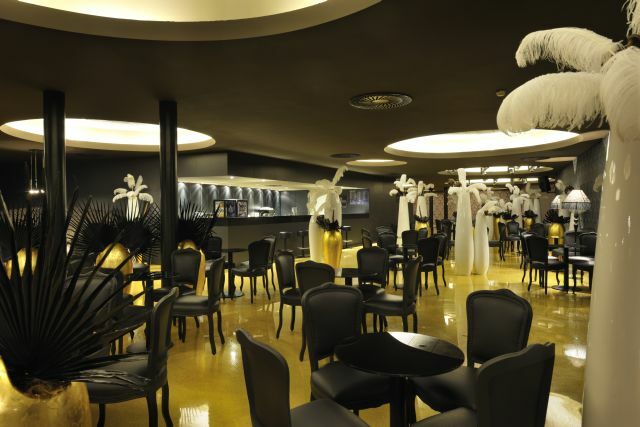 The Wellcard loyalty card of Terme Olimia is a club, which allows you to collect points and earn discounts! It is based on collecting reward points on all purchases in Terme Olimia, which generates points that give you discounts on purchases. For every purchase over 90.00 €, when staying at any of the hotels or apartments in Terme Olimia, every 20.00 € generates 1 point for your bonus voucher. For every purchase over 10.00 € for wellness, health care, or restaurant services, every 10.00 € generates 1 point that you collect and get a bonus voucher. If you collect a total of at least 20 points, your Wellcard loyalty card gives you BONUS VOUCHERS of the value shown in the table below. How to use Wellcard bonus vouchers? Points are collected on your account. Every purchase increases the number of points that you have already collected. When reaching a certain amount of a single purchase, you can decide whether to use the points to pay for a service of Terme Olimia or continue to collect points and get an even higher value of bonus voucher. Bonus vouchers can be used anywhere in Terme Olimia. Inform your receptionist / cashier you will cash in a bonus voucher. Points are collected over a period of one year from the date of your first purchase. WHAT ADDITIONAL BENEFITS DOES THE WELLCARD LOYALTY CARD BRING? Twice a year we prepare for Wellcard loyalty cardholders an exclusive offer, which allows a 20 % discount. Throughout the year we prepare many marketing special offers, published on www.terme-olimia.com. Terme Olimia cardholders are notified about them by email. If you want to be informed about new special offers, please provide us your email address. Please, send any change of your personal data or your wish to unsubscribe from receiving e-mails, to klub@terme-olimia.com. 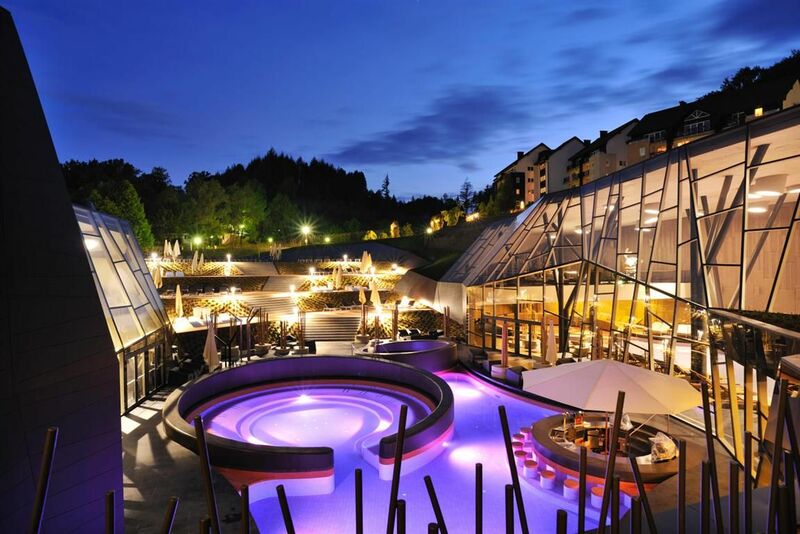 In addition to all the benefits card holders have in Terme Olimia, from now on the Wellcard gives you a discount in Terme Tuhelj, so you can enjoy the services of Hotel Well****, Vodni planet, saunas and services in the centre of care and beauty SPAeVITA, at a more affordable price. Wellcard loyalty cardholders have a discount of 5 %.